Oil and gas production, tourism, and federal government spending are important drivers of New Mexico's economy. State government has an elaborate system of tax credits and technical assistance to promote job growth and business investment, especially in new technologies. In 2017 New Mexico's gross domestic product was $94.2 billion. In 2017 the per capita personal income was $39,811 (ranked 48th in the nation). In 2008 the percentage of persons below the poverty level was 17.1%. Cattle and dairy products top the list of major animal products of New Mexico. Cattle, sheep, and other livestock graze most of the arable land of the state throughout the year. Limited, scientifically controlled dryland farming prospers alongside cattle ranching. Major crops include hay, nursery stock, pecans, and chile peppers. Hay and sorghum top the list of major dryland crops. Farmers also produce onions, potatoes, and dairy products. New Mexico specialty crops include piñon nuts, pinto beans, and chiles. The Carlsbad and Fort Sumner reclamation projects on the Pecos River and the nearby Tucumcari project provide adequate water for limited irrigation in those areas of the desert and semiarid portions of the state where scant rainfall evaporates rapidly, generally leaving insufficient water supplies for large-scale irrigation. Located upstream of Las Cruces, the Elephant Butte Reservoir provides a major irrigation source for the extensive farming along the Rio Grande. Other irrigation projects use the Colorado River basin and the San Juan River. Lumber mills in Albuquerque process pinewood, the chief commercial wood of the rich timber economy of Northern New Mexico. New Mexicans derive much of their income from mineral extraction. Even before European exploration, Native Americans mined turquoise for making jewelry. After the Spanish introduced refined silver alloys they were incorporated into the Indian jewelry designs. New Mexico produces uranium ore (see Uranium mining in New Mexico), manganese ore, potash, salt, perlite, copper ore, beryllium, and tin concentrates. New Mexico is rich in fossil fuel and alternative energy resources. Major petroleum and natural gas deposits are located in the Permian Basin in southeast New Mexico and in the San Juan Basin in the northwest. The San Juan Basin Gas Area is the largest field of proved natural gas reserves in the United States. According to the Energy Information Administration, State crude oil output is typically just over 3 percent of the annual U.S. total, and natural gas output is nearly 10 percent of the U.S. total. New Mexico also contains major coal deposits in the northwest corner of the State. The boom in hydraulic fracturing and horizonal drilling beginning in the mid-2010s led to a large increase in the production of crude oil from the Permian Basin and other U.S. sources; these developments allowed the United States to again become the world's largest producer of crude oil, in 2018. New Mexico's oil and gas operations contribute to the state's above-average release of the greenhouse gas methane, including from a national methane hot spot in the Four Corners area. Nine tenths of electricity production in the State is from coal-fired plants. Much of New Mexico's geologically-active Rocky Mountain region holds geothermal power potential, and pockets of the State are suitable for wind power development. New Mexico's southern deserts offer the State's most concentrated solar power potential. The Waste Isolation Pilot Plant (WIPP) is located in the Delaware Basin, and is used to store nuclear waste. Industrial output, centered around Albuquerque, includes electric equipment; petroleum and coal products; food processing; printing and publishing; and stone, glass, and clay products. Defense-related industries include ordnance. Important high-technology industries include lasers, data processing, solar energy and semiconductors. Federal government spending is a major driver of the New Mexico economy. In 2005 the federal government spent $2.03 on New Mexico for every dollar of tax revenue collected from the state. This rate of return is higher than any other state in the United States. The federal government is also a major employer in New Mexico providing more than a quarter of the state's jobs. Other federal installations include national observatories and the technology labs of Los Alamos National Laboratory (LANL) and Sandia National Laboratories (SNL). SNL conducts electronic and industrial research on Kirtland AFB, on the southeast side of Albuquerque. These installations also include the missile and spacecraft proving grounds at White Sands. Other federal agencies such as the National Park Service, the United States Forest Service, and the United States Bureau of Land Management are a big part of the state's rural employment base. Virgin Galactic, the first space tourism company to develop commercial flights into space, has decided to put its world headquarters and mission control at Spaceport America in Upham, New Mexico (25 miles (40 km) south of Truth or Consequences); Virgin Galactic had its inaugural launch of the VSS Enterprise spaceship in 2008, and has begun launching ordinary citizens since early 2009. The New Mexico Tourism Department estimates that in fiscal year 2006 the travel industry in New Mexico generated expenditures of $6.5 billion. The private service economy in urban New Mexico, especially in Albuquerque, has boomed[clarification needed] in recent decades.[when?] Since the end of World War II, the city has gained an ever-growing number of retirees, especially among armed forces veterans and government workers. It is also increasingly gaining notice as a health-conscious community, and contains many hospitals and a high per capita number of massage and alternative therapists. The warm, semiarid climate has contributed to the exploding population of Albuquerque, attracting new industries to New Mexico. By contrast, many heavily Indigenous American and Hispanic rural communities remain economically underdeveloped. Feature films have used New Mexico as a location since The Indian School in 1898. Financial incentives and construction of facilities (such as The Albuquerque Studios) have created opportunities for locally based crew members with production reaching an all-time high in 2007. As of the end of August 2007, 30 major projects have been filmed in the state, more than in any other calendar year in history. The New Mexico Film Office assists the industry in coming to and filming in the state. In 2011 the state placed a cap of $50 million on tax credits for the film industry. The cost of funding the incentive soared from just $3.4 million in 2004 to $76.7 million in 2009. Garson Studios is an established film production facility is on the campus of Santa Fe University of Art and Design that has helped turn out many feature-length films with its soundstage and high tech equipment. Film and television post-production9 is also growing? New Mexico imposes a gross receipts tax on businesses. This resembles a sales tax but unlike the sales taxes in many states it applies to services as well as tangible goods. Normally the business passes the tax on to the purchaser. There is a tax imposed by the state and there may also be local taxes imposed by counties and cities. As of July 1, 2008, the combined tax rate ranged from 5.125% to 8.4375%. Property tax is imposed on real property by the state, by counties, and by school districts. In general personal property is not taxed. The taxable value of property is 1/3 of the assessed value. A tax rate of about 30 mills is applied to the taxable value, resulting in an effective tax rate of about 1%. In the 2005 tax year the average millage was about 26.47 for residential property and 29.80 for non-residential property. Assessed values of residences cannot be increased by more than 3% per year unless the residence is remodeled or sold. ^ a b c d "U.S. Dept of Commerce Bureau of Economic Statistics". U.S Dept of Commerce Bureau of Economic Statistics. September 25, 2018. Retrieved January 4, 2019. ^ Bureau, U.S. Census. "American FactFinder - Search". factfinder.Census.gov. Retrieved August 4, 2017. ^ Division, U.S. Census Bureau, Foreign Trade. "State Exports from New Mexico". www.Census.gov. Retrieved August 4, 2017. ^ "Anderson, Lee. "The History of American Indian Jewelry" – Anderson's Americana Indian & Western Shows". Americana.net. Retrieved August 4, 2017. ^ Kevin Robinson-Avila - Journal Staff. "Study: Methane emissions much higher than EPA says". www.abqjournal.com. Retrieved October 6, 2018. ^ "EIA State Energy Profiles: New Mexico". June 12, 2008. Retrieved June 24, 2008. ^ EIA (July 27, 2012). "Electric Power Monthly Table 1.17.A." United States Department of Energy. Retrieved August 15, 2012. ^ EIA (July 27, 2012). "Electric Power Monthly Table 1.17.B." United States Department of Energy. Retrieved August 15, 2012. ^ "Federal Spending Received Per Dollar of Taxes Paid by State, 2005". Tax Foundation. October 9, 2007. Archived from the original on December 16, 2008. Retrieved September 21, 2008. ^ "Virgin Galactic's website overview of what is to come". VirginGalactic.com. Archived from the original on June 16, 2008. Retrieved August 4, 2017. ^ "Blogger". spaceports.Blogspot.com. Retrieved August 4, 2017. ^ "What Would a London to Sydney Nonstop Flight Look Like?". About.com. Retrieved August 4, 2017. ^ Schneider, Wolf "Facilities fuel New Mexico production boom". The Hollywood Reporter. – September 18, 2007. ^ "New Mexico Filmography". New Mexico Film Office. Retrieved September 11, 2007. ^ "Welcome to the New Mexico Film Office". www.NMFilm.com. Retrieved August 4, 2017. ^ "Page not found – Film Works California". Filmla.com. Archived from the original on April 15, 2012. Retrieved August 4, 2017. ^ Seimers, Erik (May 27, 2007). "Special effects company to open Duke City branch". Albuquerque Tribune. ^ "Gross Receipts Tax Rate Schedule, Effective July 1, 2008 through December 31, 2008" (PDF). State of New Mexico, Taxation and Revenue Department. June 5, 2008. Retrieved October 9, 2008. ^ Domrzalski, Dennis (September 19, 2003). "28 New Mexico towns tap into $45M in incentives". New Mexico Business Weekly. OCLC 30948175. Retrieved June 2, 2008. ^ "Governor Signs Film Production Tax Incentives". New Mexico Economic Development Department. March 4, 2002. Archived from the original on October 12, 2007. Retrieved September 12, 2007. ^ Hay, Kiera (December 10, 2007). "State's Incentives Keep Film Industry Growing". Albuquerque Journal. OCLC 9392114. Retrieved June 2, 2008. 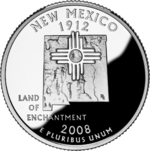 Wikimedia Commons has media related to Economy of New Mexico.